Today, I’m featuring the Petal Palette stamp set from the upcoming Occasions Catalog. One of my favorite images from the stamp set is the little birdie. I love the look of old fashioned polaroid photos so that’s what I tried to recreate here – a picture of a birdie on a branch. He just looks so sweet. You are going to love this stamp set when you see all the images. And what’s even better is that we have a coordinating thinlet die set with the stamp set. You’ll definitely want to buy both. I did not get to preview the die set so I hand cut everything I used from this stamp set. I will admit that it took me half a dozen attempts to get the branch stamped just right. 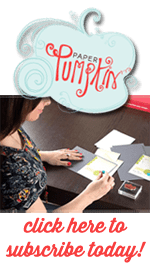 Stampin Up is getting ready to release our own stamp positioning tool and it will make this type of stamping so much easier. I’ll have more details on that tool later when we get closer to a preview date. After a few attempts, I realized that the leaves are supposed to have that softer, watercolored look anyway. To get the brown branch with the green leaves, I used my Stampin Up markers to color the stamp and then stamped the image. I hope you enjoyed my little birdie. To Hop to the next page, click the Next link here and it will take you to Katharina Baranski’s page. Or you can check out any of the pages by clicking on the name below. I really like your card. Simple and clean. beautiful!